Why Does Our Blood Get Pumping After Being Scared? And what does this all have to do with making a movie? So, what did you feel after getting that jolt? Did you get a rush? According to researchers, when we get scared our body releases adrenaline into our bloodstream. That’s the rush. But then, after your body realizes that you’ve survived a scary moment, your brain rewards you with a natural coping chemical … called dopamine. Adrenaline and dopamine combined … That’s the same reaction if you took cocaine. That’s it. That’s why we love scary movies. We need that rush of cocaine — it’s as if we’re some kind of 1980’s yuppy stock broker. 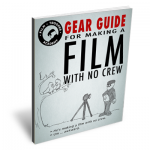 So, How Does This Apply When Making A Movie? Well, for my new feature film I’m making, I have one job … and that is to scare an audience. That’s it … scare an audience. Well, if people love getting that cocaine rush from seeing a scary movie, then I have to act as if I’m a drug pusher … but do it as a filmmaker. If you want to know more about why we love being scared, then I put together a playlist of YouTube videos that have done a much better job than what I can offer you. 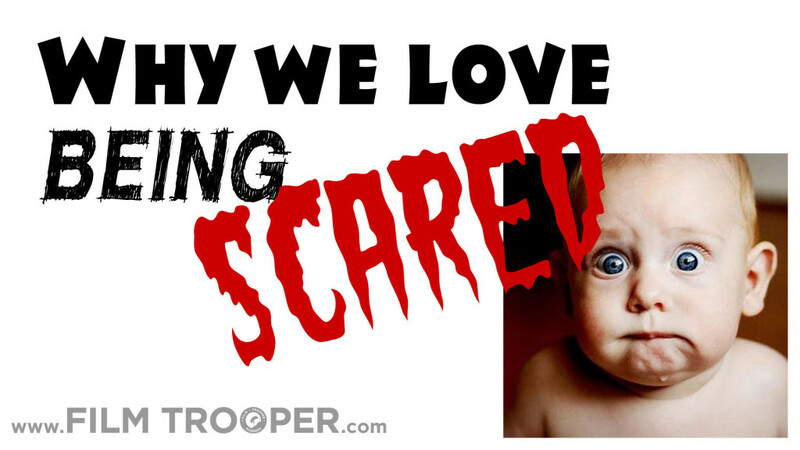 We love being scared, because it is one of the four basic emotions of being human. Now … do people really like being scared? What people like is the adrenaline rush and the transformation of what happens after being scared. The transformation process of being scared is also attributed to being part of a tribal ritual. A rite of passage. A sense of accomplishment for surviving what scares us. I have to create an experience where an audience gets a rush of adrenaline that is carefully released to them over the course of 90 minutes. This is why having a community experience for a scary film is so important for the film’s success. Just releasing a scary film online for someone to watch alone, may not be as impactful as building a community experience. Now this doesn’t mean it has to be a theatrical release, it just means that the end result must contain some kind of community gathering to heighten the experience. That’s our job’s as Film Troopers … to serve an audience. Okay, if I’m supposed to be a drug pusher for 90 minutes, then how do I carefully release and control when my addicts (my audience) gets their doses? 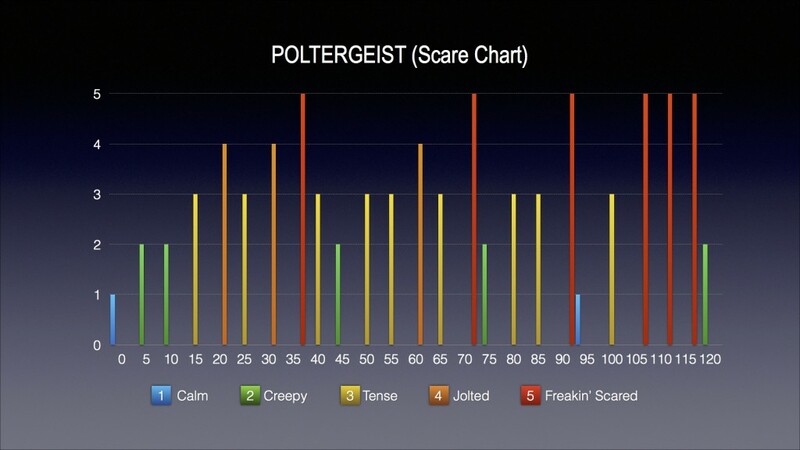 Let’s take a look at these goofy charts I made up for the films Poltergeist* and The Conjuring*. The bottom horizontal numbers represent the minutes of the film broken into 5 minute increments … 5 minutes, 10 minutes, and so on. For the film Poltergeist, you can see that the real big scare doesn’t occur until the 30 minute mark, which interestingly is the point where the story breaks from Act I into Act II. After each Freakin’ Scared moment (the red bar) you can see that the story settles back down into either a Calm, Creepy, or Tense state of emotional communication. This is important, because as a drug pusher (sorry a filmmaker), when you give your addicts (the audience) a dose of adrenaline, you need to follow it up with a moment that allows your addicts to get their dopamine fix. Otherwise they won’t enjoy the high. Then if you look at the chart towards the end, when we get into Act III, all hell breaks loose. This is the job of the pusher filmmaker … give your audience a massive dose of adrenaline at the end, so they’ll be so jacked up when they leave your movie … that they’ll be basking in the glow of their huge dose of dopamine. 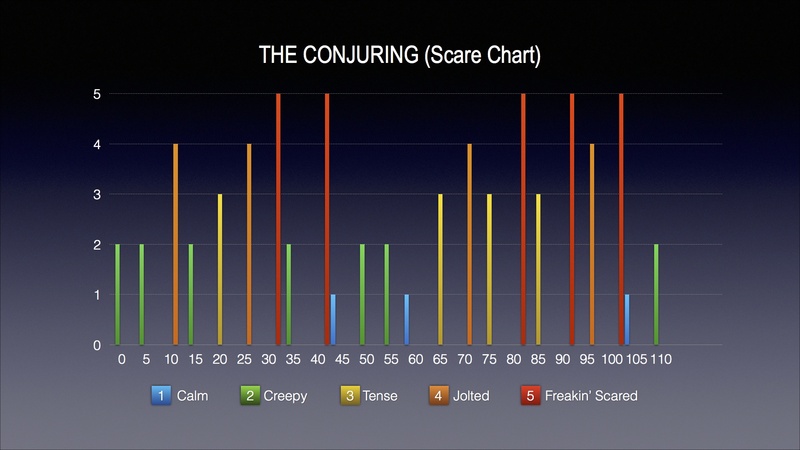 The film, The Conjuring, follows almost the same pattern as Poltergeist when it comes to releasing the doses of Freakin’ Scared. How Do You Apply These Charts To Your Movie? So, when I finish writing my new script, I have to put it through this chart process to make sure that I’ve adequately written in enough beats where my addicts (my audience) can get their adrenaline and dopamine fix throughout the 90 minute time period. If I’ve written in too many Freakin’ Scared moments, then it may loose its impact. I need to make sure I’m following every Freakin’ Scared moment with a recovery beat, so the audience can process their dopamine. This is how they’ll get their high. But if the psychology holds true, than that’s the whole job of a filmmaker making a scary movie … feed the audience their cocaine fix. Now that we know why people love scary movies … the next big question is what will scare them enough that they’ll get a good drug fix? What is your favorite scary moment in any film? Most of the time, you’re asked what your favorite scary movie is … but let’s drill down deep and stick to a specific scene. Thanks for tuning in. I’ll see you next time.